Downey (right) and Laflamme discuss research in ISU CCEE’s structural engineering laboratory. Photo by Tindall. 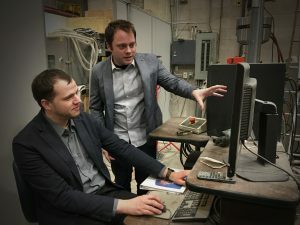 With ingenuity, this civil engineering doctoral candidate earned a patent for research that he completed as an outstanding undergraduate student. 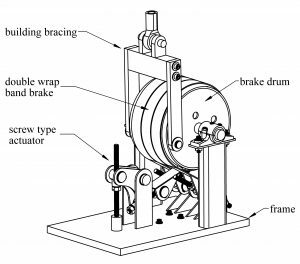 In late February, Downey received news from the U.S. Patent and Trademark Office that his invention, “Apparatus, method, and system for high capacity band brake type variable friction damping of movement of structures,” had earned a patent. As described by Downey, Patent No. US 9,896,836 B1 is a damper used to make structures more resilient to multi-hazard events – earthquakes, high wind, hurricanes, tsunamis or a combination thereof. The damper, of which Downey is the lead inventor, has a high damping force in comparison to other dampers previously tested in its category. A technical drawing of Downey’s variable damper. Courtesy Austin Downey. Here is how it works: forces (like high winds or earthquakes) can cause a building to vibrate. When these events occurs, a building can experience violent vibrations. Downey’s banded rotary friction damper spins about an axis and absorbs the dynamic energy of the vibrations. 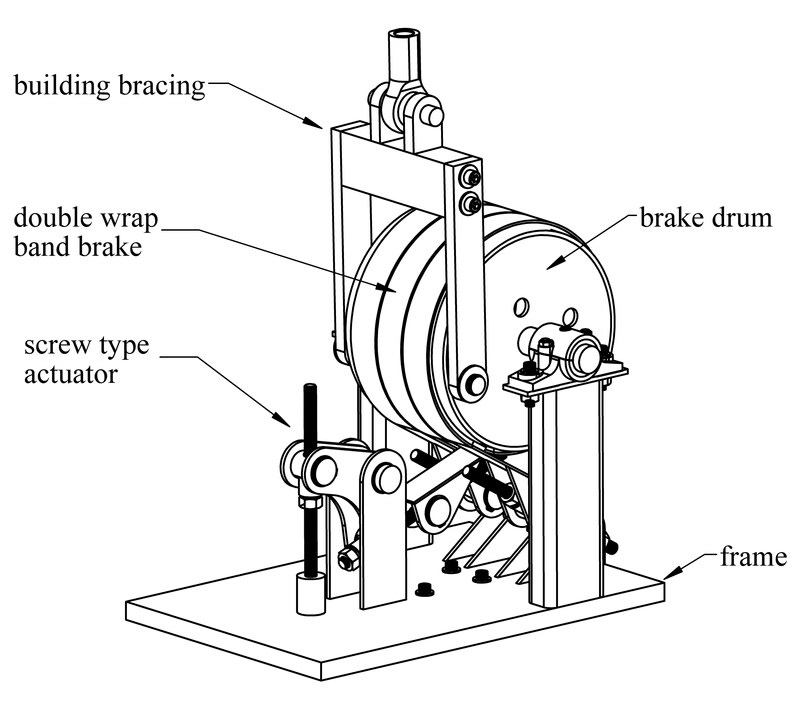 This is also a variable damper, so it can apply different amounts of damping force depending on the forces acting on the buildings. “This style of damper could open up a new class of design, where you can design buildings to be more resilient to high winds and earthquakes using these dampers,” Downey says. In addition, he says the damper could make a building lighter, cheaper, taller and safer, all while reducing nonessential structural reinforcement. Downey began his undergraduate degree in civil engineering at ISU in 2011. He soon started looking for an experience to supplement the knowledge he was gaining in his courses. He applied for an undergraduate research opportunity, the Pak-Liu Fung Scholarship, in 2013. He would receive the scholarship for two semesters running. 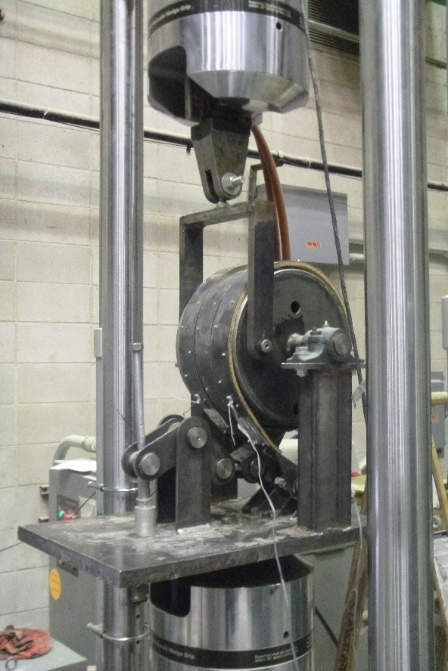 This scholarship was how Downey began his work on his banded rotary friction damper … and it was how he found an outlet for his creative abilities. Downey’s damper can make structures more resilient to multi-hazard events. Photo courtesy Austin Downey. In Downey’s experience, undergraduate research led to graduate school and research career goals. Chris Rehmann, the associate chair for undergraduate affairs at ISU’s Department of Civil, Construction and Environmental Engineering (ISU CCEE), says one of the most important aspects to research is getting students to attempt it early. At ISU CCEE, undergraduates can get involved with transportation or environmental streams of ISU’s Freshman Research Initiative. They can also approach a faculty member to work one-to-one on research, either for credit or for salary. Rehmann stresses that students can gain experience and build professional relationships with faculty, all at the same time. When undergraduates supplement coursework with exceptional research opportunities, their entire problem-solving experience becomes richer. If you are interested in exploring research opportunities, including applying for the Pak-Liu Fung Scholarship, email Associate Chair for Undergraduate Affairs Chris Rehmann at rehmann@iastate.edu. Keep track of undergraduate opportunities by following ISU CCEE on Facebook, Twitter, and LinkedIn (Iowa State University Civil, Construction and Environmental Engineering and ISUConE).